In an effort to kick start this rather neglected blog, here’s an article I recently wrote for Arts Professional magazine in my capacity as Creative Producer for Stellar Quines theatre company. 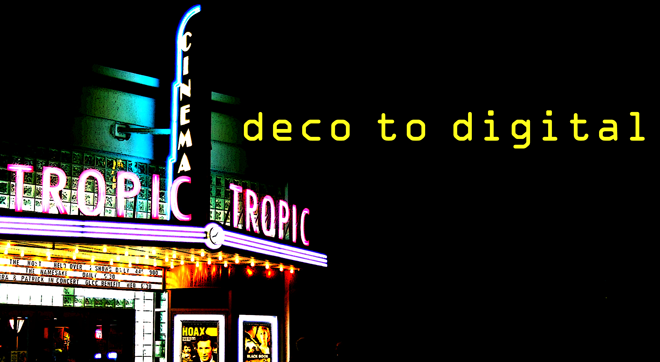 Normal Deco to Digital service will soon be resumed. It’s fair to say that a couple of years ago Stellar Quines was in the digital Dark Ages. Like many arts organisations we stumbled into our first AmbITion workshop wondering what all the digital fuss was about and what it had to do with live theatre. The workshop turned out to be a eureka moment in the company’s history as we emerged with our heads spinning with a new found realisation of the potentials of a brave new digital world. As a result Stellar Quines’ mindset switched from analogue to digital. New possibilities and urgencies inherent within our core values opened up and the company caught the innovation bug. In tandem with our mission to be bold, relevant and brave, Stellar Quines now considers live theatre just one element of a wider theatrical process and we are committed to exploring, both artistically and entrepreneurially, the potentials of innovation within the equalities realm. That said, it’s been a long journey: a journey characterised by learning curves, trial and error, experimentation, a lot of discussion and a commitment to venturing outside of comfort zones both in terms of who we work with and what we ask of those who work with us. In practical terms, the AmbITion business case Stellar Quines created has three main strands: to become a virtual hub for all those interested in women and theatre; to deliver a series of creative digital labs where the interface between live theatre and the possibilities emerging through the virtual and digital worlds can be tested; and to train ourselves and those who work with us in new skills, new outlooks and new understandings – thus ensuring the journey continues. At the planning stage, we considered the virtual hub as the natural first strand to develop. However, working reality has proved that experimentation through the creative digital labs had to come first. To date this work has been at the forefront of implementing our AmbITion plans, the belief being that trying out new ideas would inform the development of the company’s online and virtual presence. The major digital lab Stellar Quines has undertaken so far is the development of an experimental prototype – a 3D digitised version of our last production, ANA – a first for Scottish theatre. The aim of this lab was to research whether 3D film can offer an artistic and commercially viable experience of live theatre. Thanks to collaborations with Glasgow’s Digital Design Studio, Edinburgh Napier University’s Institute for Creative Industries and Freakworks film production company, we have succeeded in creating a prototype. Following an initial test screening of extracts to an invited audience, Dundee Contemporary Arts are now working with us to create a Digital Cinema Package out of this prototype which will be screened at this venue and in Scotland’s mobile cinema (the Screen Machine). At these screenings we will test the viability of the product and most importantly get to hear what audiences think of it. This lab has been tremendously important in opening up the potential of new platforms to deliver work, experimenting with the company’s artistic remit and enabling partners such as the Screen Machine to broaden the programme of content they can deliver to isolated audiences. The second digital lab Stellar Quines has undertaken so far involved the live streaming of one of our Rehearsal Rooms – a long-standing strand of our activity aimed at developing new scripts and emerging writers. Through a Rehearsal Room a new piece of work is rehearsed during the day and performed script-in-hand in front of a live audience in the evening. The live audience have their say and their input informs the development of the work. Via this digital lab we live streamed both part of the day-time rehearsal and all of the evening performance thus enabling anyone anywhere to access and participate, not least of which was the writer herself who is based in Québec. Moving forward, this lab is now informing the creation of Stellar Quines’ virtual hub, and a third digital lab aimed at developing further the possibilities of digitising content and working with film companies is in the pipeline. Moving forward again, innovation now underpins everything Stellar Quines does, not least of which is our on-going interrogation of the company’s core remit and public value. It’s easy to dismiss a women’s theatre that’s 18-years old as being old fashioned, old school and part of the Dark Ages. It’s so not easy when that company is pioneering new prototypes, experimenting with the emerging possibilities of film and theatre working together and reaching out to women across the globe. Read the original article in Arts Professional. New era for film in the UK? The BFI is predicting a new era for film in the UK as it prepares to restructure and reorganise in light of its promotion to the dizzy heights of the leading UK body for film. But what is this new era really going to mean to the quality and diversity of content on our screens? 2010 is all set to prove itself as a bumper year at UK box office, thanks to recession, big blockbusters and 3D. But with Little Fockers currently top of the box office pops after packing away over £3m in ticket sales in its first five days of release in the UK, it feels unlikely that this new era will fuel any real change in the type of content that keeps the cinema near you in the red. Change however does trickle beneath the frozen waters of Hollywood dominance. Curzon Cinemas has launched Curzon On Demand a service that allows you to view the latest cinema releases from the comfort of your own home. This is a great opportunity for those who can’t reach specialist cinemas such as the Curzon to access the latest independent releases as well as the occasional classic. And following on from the success of the National Theatre and New York Met, the Bolshoi Ballet now plan to beam four of their performances to 300 cinemas around the world. But is a new era really coming for the UK film industry, or merely a shift in who gets the cash from the DCMS? Too soon to say. But as 2010 rolls into 2011 it looks likely that hard times will hit us all. This could be good news for a recession friendly industry that provides affordable escape from the harsh realities of being hard up. But in terms of fueling the industry with new talent, fresh ideas, innovative ways of working and stories from around the world, the new era might not bring anything new at all. Film Power or the Power of Film? Film, cinema and the moving image are entering a new phase in Scotland with the creation of the Centre for the Moving Image which will incorporate the Edinburgh International Film Festival and the city’s Filmhouse cinema. Mark Cousins and Tilda Swinton have come on board as creative advisors in what feels like another major shift for the landscape of the arts in Scotland. Meanwhile the hopes of Edinburgh’s grand old lady of cinemas – the Odeon on Clerk Street – have been raised as a group of recent graduates aspire to breath new life into its boarded up auditorium. This feels like a coming of age for Film Studies – a subject I was once told wasn’t a ‘proper’ one. I love that graduates are emerging with energy, passion and the confidence to take a piece of cinema history into their own hands and give it a workable future. All of this is refreshing news at a time when Hollywood is accused of being too scared to take risks and 3D is already being touted as yesterday’s news. In the week that Warner Bros cancelled the release of the next Harry Potter film in 3D, you have to question whether plans to convert the Star Wars films into 3D are going to rake in the anticipated profits from a cynical audience who are counting the pennies and seen it all before (both 3D and Star Wars). Other head thumpingly dull news is that James Cameron has toped the Guardian’s Film Power 100 list. Please, please can we have a list of people who are ‘feeling the force’ of film, circumnavigating the industry’s traditional ‘gatekeepers’ and taking its future into their own hands. Let’s have a list that celebrates the likes of the graduates planning a coup of Edinburgh’s old Odeon, the filmmakers who are crowd sourcing footage and finance, the artists who are breathing new life into archive film, mob cinema and the 8 1/2 Foundation. Film has come of age and its maturity has nothing to do with an expensive in-your-face format, powerful men, or industry veterans squeezing every last penny of profit out of a thirty year old franchise. It has everything to do with people who are passionate about cinema and filmmakers sticking two fingers up at the likes of lists celebrating those who have ‘Film Power’. Because such is the power of film! UKFC – RIP? probably not. It’s no great surprise that the UK government’s Department for Culture Media and Sport today announced that it plans to abolish the UK Film Council. The government deals out around £25m to the UKFC each year and if you want to get a health check on the industry it presides over, check out the organisation’s latest Statistical Yearbook. There is no denying that the British film industry is something to be proud of. The list of films, careers and talent the UKFC has invested in over its ten year existence is impressive. If you don’t believe me, check here for a list of its achievements, along with the number of jobs the industry creates, the huge growth of the UK box office over the past decade and the amount of money (£1.2 billion) the nation’s film industry pours back into the Exchequer’s coffers each year. The flip side though is a couple of nagging questions. Firstly, does the UK need two national film organisations? The BFI is a charity and protected by Royal Charter so the DCMS can’t touch it. But is it, as an organisation, ready/fit for purpose to take back on the work the UKFC took off it ten years ago and drive the industry forward through its difficult, but unavoidable, transition into the digital era? The second question is where is the sustainability of the British film industry? Don’t get me wrong the industry is well deserving of public funding and more than returns its investment back to the public purse. But do proposals such as PACT’s new business model for UK film producers offer a feasible and bureaucratically cheaper alternative? Tim Bevan, Chairman of the UKFC, has reacted to today’s news by claiming that the government’s decision is a bad one, “imposed without consultation or evaluation… driven by short-term thinking and political expediency." And that the British film industry deserves better. This is the crux of why the UKFC will not rest in peace. Knee jerk cuts will only stunt the industry’s growth and fuel resentment amongst those who will be denied access to opportunities within it, whose stories will never be told on the big screen and whose local cinemas are at risk. All of which will only make for a small society. What’s happening to cinema? According to the BBC, cinema is ‘good for theatre’ as audiences attending live screenings of the National Theatre’s performances of Phedre, are supposedly more emotionally engaged in the production than those who were actually there. Read the full story here. And, moving outside of London and up to Edinburgh, live performances of the Traverse Theatre’s Impossible Things Before Breakfast, part of their Fringe programme 2010, are to be simultaneously broadcast into Picturehouse cinemas around the UK. I love this blurring of the boundaries between theatre and cinema and the mixing of audiences. Not least of which because of the two very different experiences of one event this allows. I like the idea that I can choose to see the show ‘in the flesh’ at the Traverse Theatre, or ‘on the screen’ down the road at the Cameo cinema. At the other end of the film chain, Ridley Scott has announced plans to crowdsource a new documentary called Life in a Day via YouTube. Upload your footage of a moment in your life on 24 July for a chance to be part of the film. Anyone whose footage does make it into the final feature will be credited as co-director. Find out more here. What is this? A cheap way to make a film whose profits will stay firmly out of the pockets of those who contributed the footage? A unique chance to shine on the big screen without having to bash your way through a long line of industry gatekeepers? An honest attempt to give everyone the chance of being a star and have a snippet of their story seen on the big screen? Maybe all three. From an industry point of view, the equally interesting factor will be the free screenings of this film on YouTube. Surely cinema figures will stay buoyant as the project is so unique, but what will viewing figures reach on YouTube? And what seeds for the future of film exhibition does this plant? Ever more interesting times and ever more challenges and opportunities for cinemas. This bold statement was raised at the recent Northern Lights Film Festival Industry Day dedicated to crowd sourcing and digital frontiers. A keynote speech delivered by Liz Rosenthal of Power to the Pixel raised questions on how storytelling will evolve in the digital age that is no longer restricted by format. And how filmmakers, working across platforms can extend audiences and increase finance. 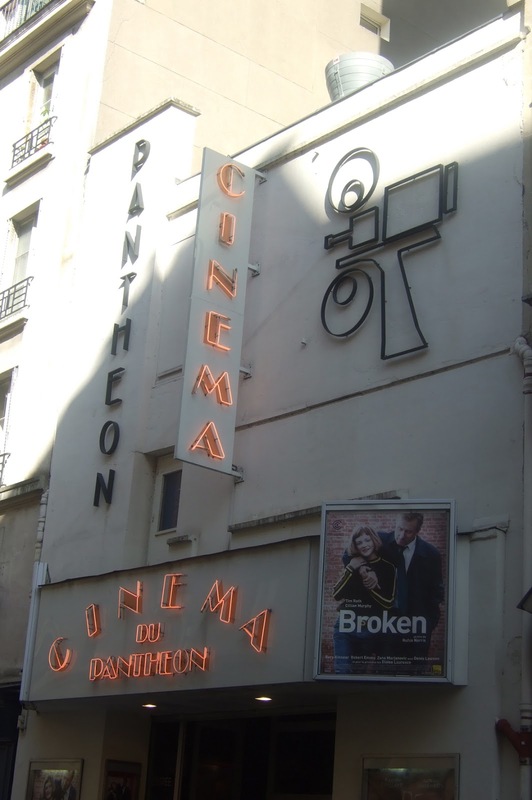 This blog will share some of the success stories raised during the speech and also take a side step and look at how cinemas can learn from/join forces with filmmakers in opening up new ways of engaging audiences. In the traditional model of filmmaking, the storyteller is not in control of how the story is told – this is managed through the distribution and exhibition network and arguably, this model has little connection with the audience. Now fragmented platforms are appearing for moving image work and audiences are watching film and experiencing stories in many different ways. All of which are giving audiences more choice and more control. Examples cited include documentary filmmaker Robert Greenwald and his Brave New Films who have built up a large database of email subscribers who receive information about films as they are being made and often even make donations to ensure that the films are financed. Therefore when the films are produced, there is already a large audience who know about the film, want to see it and are stakeholders in it. In addition, under the banner of Brave New Theaters, Brave New Films is promoting a people powered movie revolution. When you buy a DVD from Brave New Theater you also get the rights to screen it wherever you like and they will even give you tips on how to plan a successful screening. Wreck a Movie is the world’s first internet film studio. Anyone can join and contribute to films that are already being made or upload their own film idea and invite people to join in. This way of working completely turns around the usual model of passive fans who are marketed to once a distributor has picked up the film. This model offer fans the chance to be part of the life of the film. Indie GoGo is another organisation using collaborative working to fund ideas and encourage innovation. While Four Eyed Monsters develop a community around their films and then mobilise fans to ask cinemas to screen their work. Thus cinema turns into a social event online as well as in a physical cinema. Another example worth a mention is filmmaker Nina Paley who rejected an offer from a distributor to buy the UK rights for her film Sita Sings the Blues and instead gives them out for free through a Creative Commons license and encourages anyone to screen her film. Nina sells a range of collectable merchandise related to the film from which she makes a profit – a bit like the way multi plexes make money through popcorn sales. By keeping control over her film, and not selling the rights to a distributor, Nina has made more money and the film has been seen by many more people than if she had gone down the traditional route. So what has this got to do with cinema? Lots! Firstly we can learn much from the possibilities of a film having a life beyond a screening and an engaged fan base. Many filmmakers have found that folk online spend 30% of their time watching the film and 70% engaged in conversation about it. Cinemas and festivals need to join in the conversation and not just passively wait for its release date before giving a film any marketing attention or spend. Filmmakers and cinemas both complain about the amount of control distributors have and the dominance of major studios. So we should be seeking ways of joining forces. Offering more than monthly film clubs for a few local filmmakers to get together and chat and read each other scripts. Let’s really start working with filmmakers and engaging with their fan base, negotiating screen time for them, make time for conversation, investigate new models, get involved with the life of their work and in doing so refresh cinema. With the huge capitol outlay of converting to digital which threatens to cripple independent exhibitors, or lock them into rigid VPF deals, it's time to seize the day and dip our toes in the waters of shared culture. Filmmakers are making inroads into developing new models and so should cinemas, because we too are not fighting piracy, but obscurity. Fantastic news on International Women’s Day, finally a woman wins the Oscar for best director. Well done Kathryn and about time too. Also a victory of 2D over 3D as Avatar fails to be awarded best film. Although many are now saying that 3D is spreading fast and the days of 3D drama are on the way. Good news also for the old Regent cinema in Leven in Fife, West Scotland. Opened in 1922, the like many old cinemas, the Regent had been running as a bingo hall, but after being leased to the Leven Community Cinema Group this old Art Deco gem has been given a new lease of life and plans to open in a few days. Go Leven, the Regent and all who dream in her. Creative Producer and long time Cinema Development Advisor and Film Programmer.